Paul Simpson has written another book about ships, life and voyages in the great days of sail. (The last was Around Cape Horn Once More, previously reviewed). 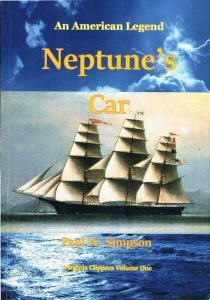 This time he has told the story of the clipper Neptune’s Car, built at Gosport, now part of Portsmouth, Virginia not far from Norfolk and completed in 1853. She was ordered by the New York firm of Page and Allen to a design by the famous builder Donald MacKay and when the hull was complete it was towed to New York for fitting out. Her figurehead of the sea god in his “car” made of a giant scallop shell drawn by sea-horses sailed the seven seas for sixteen years, about par for a softwood clipper. She was eventually abandoned, worn out, in Hong Kong harbour in 1869. The new clipper’s first captain was the notorious “Bully” Forbes, the most ruthless of hard-case American shipmasters. He took her to San Francisco, across the Pacific to Hong Kong, then, as no tea cargo was on offer, to Calcutta for Jute and back to New York. He was replaced for her second voyage by the capable and respected Joshua Patten who took his wife Mary Ann Patten along, but it was on the third voyage that Neptune’s Car became famous when Captain Patten fell seriously ill. With a mutinous and treacherous first mate locked in his cabin, the young and pregnant Mrs. Patten took command and, with the aid of an illiterate second mate, brought the ship round Cape Horn and onward to San Francisco. She became quite a celebrity at the time but the Pattens were treated rather shabbily by the owners. Between 1853 and 1862 the clipper made six very long voyages under various captains. Forbes came back again at one point, his mates ruling with belaying pins and brass knuckles, which provoked a mutiny in Singapore. In 1862 came the Civil War. 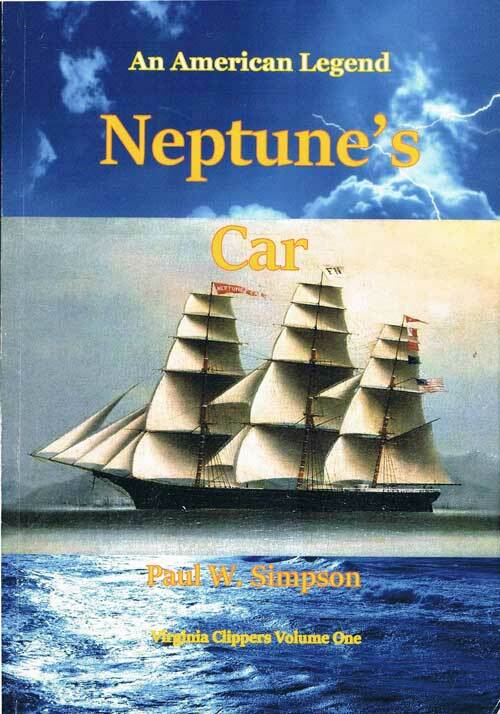 Neptune’s Car was in San Francisco but made it back to New York without encountering any of the Confederate commerce raiders which were literally, destroying, by burning, the fleet of beautiful clippers that flew the Union flag. Then, like many other Union merchant ships, she was sent to England and sold. She was not a financial success for her British owners as she was deteriorating and needed frequent repairs. She made only one successful voyage; then, in the midst of the second, she was abandoned as a hulk in Hong Kong in 1869. Mr. Simpson has done a valuable service with his spirited descriptions of gales encountered, battles against headwinds trying to round Cape Horn, and the clipper’s speed in favourable winds. My generation was brought up on these tales but today our population is woefully ignorant of our maritime heritage. The research that went into the descriptions of voyages is remarkable: the names of shipping agents, cargoes and their value, repairs needed, are all specified. One might think the author had access to the original logbooks and ledgers but that information was probably gleaned from the Shipping News pages of contemporary newspapers. (There are twelve pages of bibliography). The numerous illustrations – photographs and reproductions of contemporary engravings and lithographs – are very clear, and well chosen. They do a lot to evoke the flavour of the times. However, there are problems. Some of his descriptions become rather repetitive: the ship is often rocketing along – well, she was fast. Some slangy terms grate a bit from overuse: Cape Horn is ‘Cape Stiff’ the anchor is the ‘mudhook’, the pilot boat is ‘farewelled’. After introduction the ship’s masters are referred to by their first names rather than their last. (I find it difficult to think of Bully Forbes as David). And there are the typos and minor nautical errors, lots of them: about one every six pages or so. And numerical errors – a lot of zeros seem to have spontaneously arisen. San Francisco is not 24000 from the equator but 2400 and the given value of the cargoes often seem to have gathered extra zeros as well. These problems were not so apparent in Around Cape Horn Once More. What this otherwise wonderful book needed, before it went to print, was a knowledgeable editor. © 2014 Charles D. Maginley.